The Last of the exhibitions is done. It has been a little over a week since the last exhibtion came to a close in Osaka (30/01/2019). I wanted to wait a while before posting anything to try and collect my thoughts about the experience I have had. During the exhibition in Osaka Masae and I were overwhelmed by the support we got not just from our family and friends but from people we had never seen before. There were so many people of all ages that came to see my work. It really took us by surprise, there was so much positive energy in the gallery space. I never expected to feel anything like that. I was proud to have been able to exhibit my work in galleries that are as nice as Canon’s and without their support I could not have done this. I did not expect the amount of people that came to each exhibition and the passion they had for photography. I feel extremely humbled by the experience and want to try and keep the energy alive. From the first guest to the last guest Masae and I tried to greet everyone we could and we loved talking to as people as possible. We are very sorry we could not talk to everyone. I hope I get the opportunity to exhibit my work again and talk to more people. Before any of the exhibitions had started I had no idea what to expect. I had never really shown my work outside of my website before and have been put off of using services like instagram for a while. That maybe starting to change though. To tell the truth in the begining I was terrified but with a bit of help from Masae I got on the right track and started to believe in what I was doing more and more. I wanted the exhibition to reflect me and the way I see things. The exhibition was not of just one subject or even style. I believe every photo is unique and not every style works for each subject. I feel like each photo had a strong compostion and to me it was important that each piece could stand on it’s own. I wanted to try something different and I felt that I could make the flow from one piece to another work. I wanted people to see something different as well. In my mind I didn’t want them to feel tired at the end, I wanted people to be able to remember at least one of the photos they liked. I just needed people to come and have a look. If I am honest I did not think that many people would come to the exhibtions outside of family and friends. If a hundred people turned up in total I would have been happy. There was more than that - a lot more. I feel the way I decided to exhibit my photography worked more that it did not. All the people were extremely positive towards it, that made me feel extremely happy. Going forward I hope the experience gives me more belief in myself and to show my photography on a more regular basis. The feeling I got when I put my work on display for the public to see for the first time was a mixture of fear and nerves. In each of the galleries we hung the work in when the pieces where being unboxed and put on the floor I have to say I did not like any of my work. I was so worried, but the minute they started to get hung on the wall the fear and nerves gave way to pride and honour. When they where all hung and lit correctly all of the anxiety was washed away by such a warm feeling of accomplishment that it made me quite emotional. I got a very similar feeling when I got my first credit on a feature film. When you have a goal and achieve it I imagine it feels like winning a gold medal at the Olympics or the World Cup. When it was all done I felt inredibly sad. It was a long journey to go one but one that was so incredibly rewarding and it was a privilege to be able to share it with others. From the beginning I was so happy to be able to hang my work in a gallery. Not one photo amongst others but an entire space, it made me feel incredibly small and very lucky to be able to accomplish one of my dreams. When starting on this journey it started with the photos and hanging them in a gallery. This was the driving force and the one that I thought was the most important. What I did not realise was what the gallery would do to others. It brought people together in a way I did not anticipate. Family and friends came together to see my work initially but then they became reunited. People who had not seen each other for a very long time had a chance to meet again. Some where planned but a lot happened by chance. That was the most incredible part I think for me how people came together. Strangers would talk to each other about the photos, friends would see each other. I loved it and that was not something I thought would happen. It took a lot of work to make the exhibitions the way I wanted them. There was something greater than the work that was needed though and that was the support of so many people. Thank you to everyone at Canon that made this possible, Shimbo-san, Akita-san, Iwata-san, Furusawa-san, Hayashida-san, Koda-san,Katsuki-san and Fukuda-san. I am honoured that you like my photos enough to allow me to display them in your galleries and I hope I will be able to again in the future. Thank you to all our friends we where so happy to see you all. I am very glad you could come and catch up with each other. As well as all the people we met for the first time, thank you all so so much. Maki and Shintaro thank you so much for helping out bringing us snacks and coffee. You where both amazing, we could not have done it with out you. Yuji, Risa, and Shutaro thank you so much for coming to the gallery. Seeing you gave us so much energy. If you told me when I was younger I would have brothers and sisters in Japan I would not have believed you. However I am very glad I do - you are all incredible people. Mami-chan and Ta-Chan thank you so much for spreading the word in Tokyo and letting Masae and I stay at your house while the exhibition was happening. Mum, Dad back in the UK. Thank you so much for everything and believing in me. I owe you a lot and I am enternally greatful. I wish you could have seen it! Maybe next time. Otosan, Okasan thank you for all your help and support I am so happy to be a part of such a lovely family. Lastly a huge Thank you to my amazing wife Masae. You give me so much confidence and believe in me so much I can never repay you. Your inspire me everyday to create and pursue my dreams. Without you none of this would have happened. I feel extremely lucky to have you by my side and to be your husband. I love you with all my heart. What is next? I want to try and make a photo book. I will keep everyone posted on the progress! I will also travel more and keep taking photos. I want to be able to exhibit my work again, it is such a good feeling and if you get the chance to do it yourself go for it! 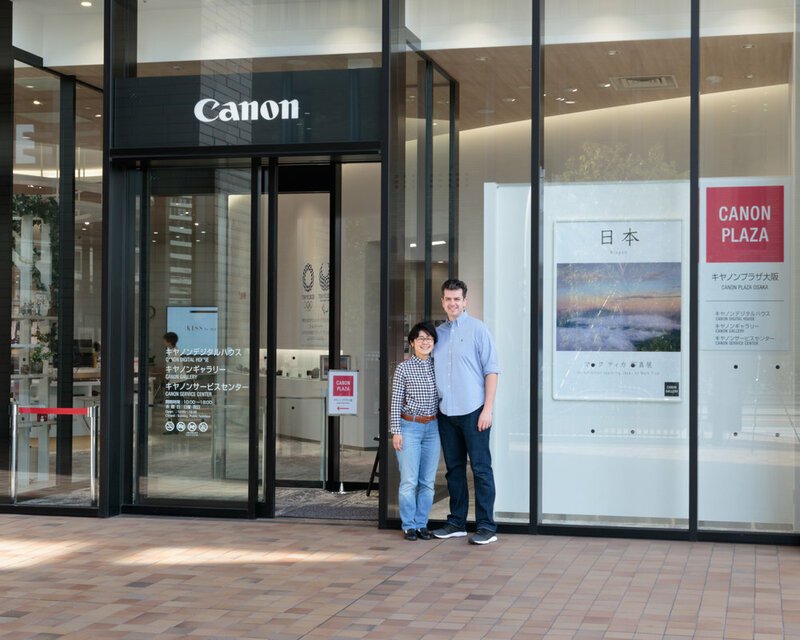 Masae and I standing outside the Canon Gallery in Osaka.